An FIR have been filed demanding arresting of all culprits, who are involved in said firing incident. The shops and business establishment remain closed in Palin township on Saturday during a bandh call, in protest against the reportedly firing incident which takes place at Rakso on poll day by a supporters of a political party wherein two persons reportedly received grievous injuries. The people of the area demanding re- polling at Rakso polling station under 18 Palin assembly constituency of Kra Daadi. Kra Daadi Superintendent of Police Surendra Choudhary when contacted said that an FIR have been registered at Palin Police station and one injured person have been medicated and out of danger. He said that another FIR have also been received by the presiding officer of 38 Rakso polling station that the polling personnel with poling materials in three buses were intercept near Meer on April 11 night while transporting the poll materials to Koloriang DEO headquarter. unknown miscreants in large numbers threatened to set fire all materials and due to seriousness of the situation and life threatening few polling materials were taken away. The case have been registered and investigation have been launched to nab the culprit. 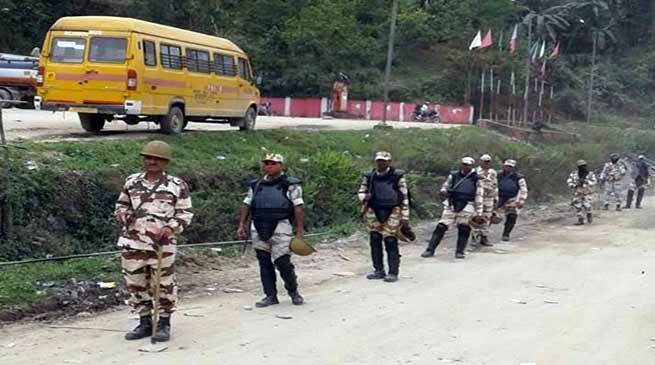 There is no any untoward incident in the township while security forces and police personnel flagged march in the street to maintain law and order, peace and tranquillity. SP added.